This is one of the lighter fare Hitchcock flicks. While certainly suspenseful, this at times plays more as a romantic comedy. I’d seen this once, years ago, and remember the witty banter and the general plot. I remember it being a great light Hitchcock movie, and have been itching to see it again. I watched TO CATCH A THIEF (1955) on 1.23.12. It was my second viewing of the film. I actually sort of dislike the first ten minutes of this film. It’s not Cary Grant’s fault. As former thief John Robie he attempts to escape the police, all of whom think he is responsible for a recent string of robberies. The opening shots of a black cat edited with a hand taking jewels and then a black cat and a hand taking jewels and on and on is a little heavy handed. In fact, this is one of Hitchcock’s most heavy-handedly directed features. While he does a great job with much of the movie, his use of montage in this does get a little eye-rolling. Grant walks mother and daughter back to their rooms. The mother goes in first. The daughter casually saunters down the hallway. Grant follows. As she is about to close the door she leans in, kisses him with this amazing look in her eyes, and leans back out, closing the door. It is just one of the most jaw-droppingly perfect moments Hitchcock ever directed. From there the movie improves greatly. Grace Kelly’s Frances figures out Robie’s true identity. Meanwhile, Robie is trying to find the real thief so he can clear his name. All of this serves as a backdrop so that Kelly and grant can playfully tease and banter with each other. This script is just stellar (though my favorite line, when Kelly leans forward with a picnic basket and seductively asks “Would you like a leg or a breast” was actually improvised). The banter here is some of the best of the era, and the chemistry between Grant and Kelly is palpable. Just yesterday I lamented the Nicholas Cage movie NEXT and the film’s unrealistic portrayal of Jessica Biel getting together with Nicholas Cage, who had 20 years on her. 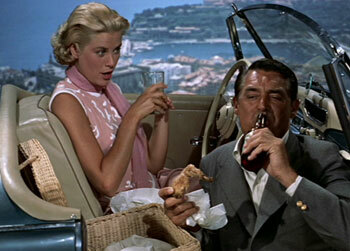 But in TO CATCH A THIEF, it doesn’t feel awkward or unrealistic. Perhaps it is the era, or the Riviera. Perhaps it is the appeal of Grant, even though he was 25 years older than Kelly. I happen to think it has most to do with the writing, and the character as played by Kelly. I absolutely believe that she would be attracted to the danger and mystique of Grant’s Robie. The costumes are beautifully done, and Edith Head must have been excited when she read the script and found that she got to costume the climactic party. In general, this is a marvel to look at. Hitchcock was still shooting things in black and white or color based on his feel of the movie. The following year, for example, he did THE WRONG MAN in black and white. But TO CATCH A THIEF is glorious Technicolor. Knowing he was using the exotic locales, it must have been just to good to pass up the opportunity to show it’s beauty. Sure the day-for-night scenes weren’t perfected yet, but there is only one that stands out as awkward in this film. Strange as it is, the weakest part of this film may be the direction. Hitchcock made some great choices to be sure (the car chase involving both Kelly and grant is well-done), but the aforementioned montages just don’t read right. No, the script and the acting carry this film where it ultimately goes. I wish the set-up was a little better, but once this gets going it really is a wonder to behold. ~ by johnlink00 on January 24, 2012.